Lawrence J. Lesko, Ph.D., F.C.P. joined the UF Research and Academic Center in Lake Nona (Orlando) in July 2011. Before joining UF, Dr. Lesko worked nearly 20 years in the Food and Drug Administration’s Center for Drug Evaluation and Research as the Director of the Office of Clinical Pharmacology. He was also Chair of the Clinical Pharmacology Coordinating Subcommittee of the FDA’s Medical Policy Coordinating Committee and authored or co-authored numerous Guidance for Industry, and started the FDA’s Voluntary Genomics Data Submission Program and Mechanistic Drug Safety Program. Lesko has published more than 200 peer-reviewed scientific publications and is a frequent invited national and international speaker in clinical pharmacology, personalized medicine, pharmacometrics and systems pharmacology. His research interests include drug development and regulatory science, quantitative clinical pharmacology and pharmacogenomics. 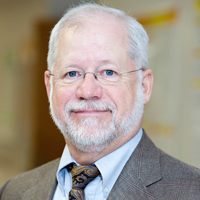 In 2011, Lesko received the Gary Neil Prize for Innovation in Drug Development from the American Society of Clinical Pharmacology and Therapeutics (ASCPT). He also received the Coriell Scientific Leadership Award for Personalized Medicine (2010), the Rawls-Palmer Progress in Medicine award from ASCPT (2007), the University of North Carolina Institute for Pharmacogenomics and Individualized Therapy Award for Clinical Service (2007), and the Nathanial B. Kwit Distinguished Service Award for Clinical Pharmacology from the American College of Clinical Pharmacology (2007). Lesko served as President of the American College of Clinical Pharmacology in 2004-2006. He is a Fellow in the Japanese Society for the Study of Xenobiotics, American College of Clinical Pharmacology and the American Association of Pharmaceutical Scientists. He is Board Certified in Clinical Pharmacology and a registered pharmacist. What is clinical utility and why should we care?